After last weeks fun concert in downtown Lynchburg, VA this week you will entertained again. Wynonna & The Big Noise will be performing at Riverfront Park on Saturday, August 11, 2018 starting at 5:00. Tickets are on sale and going fast. Wynonna Judd is an iconic performer who has received over 60 industry awards, 20 number 1 hits and countless charting singles. Her rich and commanding voice has sold over 30-million albums worldwide over her 34-year career. Wynonna & The Big Noise is led by her husband/drummer, producer, Cactus Moser. Their debut album was released in February 2016 to critical acclaim. She calls their sound country, Americana, blues, soul and rock. You will be in for a musical treat! This concert is presented by The Academy Center of the Arts. General admission tickets are $11 (including fees and taxes). A $53 VIP Ticket option is available. The VIP tickets are sold only in advance and include a private VIP entrance, premier covered seating, light refreshments provided by RA Bistro, a koozie and 2 drink tickets. Food trucks and adult beverages will be sold on-site. Food truck listings and drink menus can be found on the Academy’s Facebook page. “Doors” will open at 5:00 for happy hour. Music begins at 7:00, followed by a second band at 8:00 (both TBA) and then Wynonna & the Big Noise taking the stage at 9:00. For more information or to purchase tickets contact the Box Office at The Academy Center of the Arts or call 434.846.8499. And as always, remember, if you are staying with us at The Carriage House Inn Bed and Breakfast you can easily walk to the Riverfront Park venue. 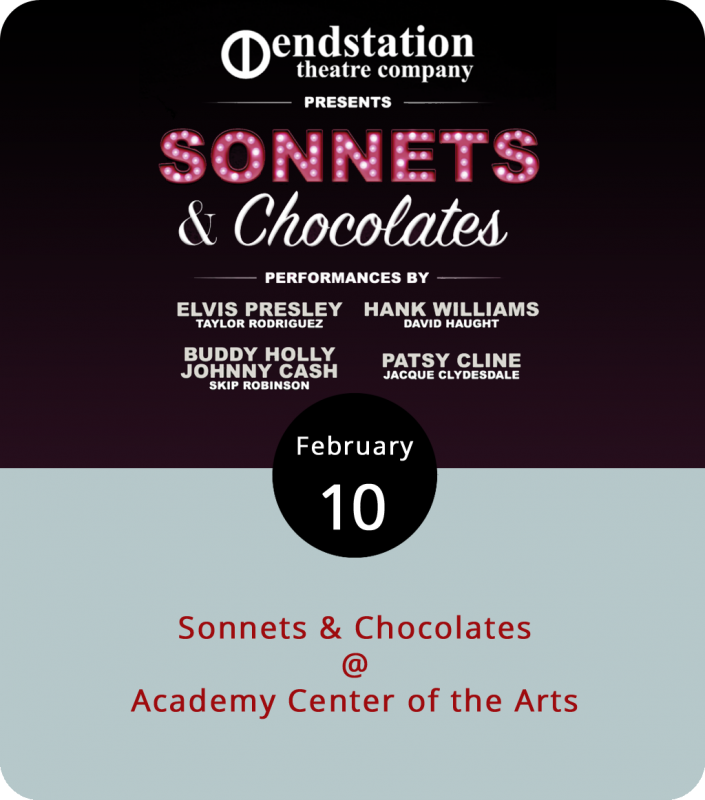 On Saturday, February 10, 2018 Lynchburg, Virginia’s Academy Center for the Arts will be hosing the 6th Annual Sonnets and Chocolates fundraiser. Presented by Endstation Theatre Company this event raises money for Endstation’s 2018 summer season. What is Sonnets and Chocolate? It is a unique date night that allows you to spend time with someone you love sipping wine, enjoying a delicious dinner, eating chocolate, mingling with others who enjoy the arts, especially the theatre arts and raising money for a theatre company that entertains those who live in the greater Lynchburg area all summer long. This year will feature a live auction that includes fantastic items, performances by some of the local actors and culminates in a vacation package to St. Thomas for 7-days and 6-nights! The event is hosted in the Academy of Fine Arts Warehouse Theatre, located at the corner of 5th and Commerce Streets in downtown Lynchburg, VA between 6:00-9:30 p.m. Tickets are $100 per person and must be purchased in advance. Call 434.226.0686 or email office@endstationtheatre.org.